Find a place for all your odds and ends with this Knick Knack Cabinet from Plaid. Give each drawer a label so you know where everything goes. 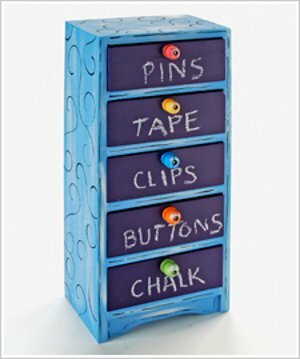 This handy storage and organization system can be used in the office or craft room. Apple Barrel ® Colors - Dutch Blue, 2 oz. Basecoat cabinet Dutch Blue. Paint drawer fronts with Purple Chalkboard Paint letting dry between coats. I so love this drawer! Perfect for small things at home. I like how cute and compact this set of drawers is. I don't have that exact piece but I did pick up some similar pieces at a thrift store. Until now I had no idea how to repurpose them. I know that now I will use those little drawers for the little odds and ends I have to organize in my art making space. I like how you used so many colours to. The chalk board paint is very clever too. Where does one find the cabinet, and how big is it? The information on this page states it is from a company called Plaid, I've been to their website and have spoken with them, they said it does not exist and isn't one of their products.